From 1st of March to 31st of May, all HP Envy and HP Envy Photo printers now come with a minimum of 12 months of ANY instant ink plan. You MUST sign up and register the printer within 7 days of turning on the printer and within the time frame of the three month promotion whilst its on. HP Envy 5010/5020/5030/5032 Are the same printer. HP Envy Photo 62xx - Were 'x' is different, same printer family, just in different colours and months included when not part of the 12 month trial. HP 7830 & 7134, same printer, including a colour digital display and SD card reader on the front. The 7830 includes a Automatic Document Feeder (ADF)(Single Side copy only) and a fax machine. *Update 6 with current prices 24th of April. (The referrer who gave me the code also gets 1 free month so win-win). When you register for Instant ink, choose the 300 page pm option. When it's up and running, you can change to a 500 page pm option. It's come at the right time for me as the kids are doing sats & gcse's this year so it's been very cost effective to print out past papers for them. The 2-sided printing is great too (and better for the environment re paper use). As you near the end of your free months, you can drop your plan down to a more appropriate level. I'll probably go to 100 pages per month for £3.49 as normally I'd print around 80-90 pages pm. OK, Just been down to Currys to buy one, and I can confirm that once registered with hp you do get 15 months of free ink (inc delivery) and an additional month if you enter the code FREELINK as detailed by others above (Thanks ). The really strange thing is that when I spoke to Currys they could not see the web page that we the public see as they can only see the 7 month offer! I had to e-mail the actual page to them of the offer for confirmation that it is the 15 month offer as that is what we the public see and apparently there computer system had not updated to the 1st day of the month (today). Unbelievable offer now I can print up-to 300 photos/copies each month for 16 months (with freelink code) and when ink is low they will automatically send out new cartridges free of charge. Thanks for the heads up and all who have commented. Does this definitely apply to printers purchased from Currys? I see the offer listed on the John Lewis products and HP direct, but not Currys. > was looking at the 6234 specifically. If any, what would be the cheapest printer in the list with separate inks? Otherwise I would opt for a mono/colour laser one. I just spoke to Curry's and they say it is only 7 months with them, not sure where you got the 15 months perhaps you could please confirm. And can someone please tell me does this mean free ink for 15 months and is there a limit to how much they will give you? Struggling to find much more detail about it on the HP site, but the way it reads to me is it’s 12 months instead of the free trial included with the printer, not as well as? the cheap currys one is listed with 7 months free to start with, can’t imagine you’d get both the 7 months + the 12 months + the freeink month + the referral month?? I got 9 months when this was cheap last time (£35 cashback so I paid £20). I bought a load of photo paper and I'm printing photos like crazy for the next 8 months! It's also a really good printer, prints fast. Just a pity that with the app you can't print from anywhere, you have to be in your wifi area. Since my printer is online, and I'm logged in with an account you should be able to print photos when you're at the park, and have them waiting when you get home. I got 9 months when this was cheap last time (£35 cashback so I paid £20). …I got 9 months when this was cheap last time (£35 cashback so I paid £20). I bought a load of photo paper and I'm printing photos like crazy for the next 8 months!It's also a really good printer, prints fast. Just a pity that with the app you can't print from anywhere, you have to be in your wifi area. Since my printer is online, and I'm logged in with an account you should be able to print photos when you're at the park, and have them waiting when you get home. 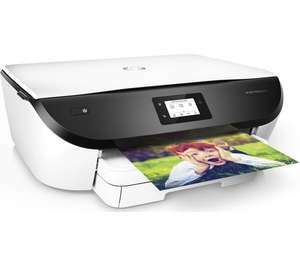 Your printer should have a e-mail address you can send photos to for it to print, mine does though I've not used it for pictures yet. Does this definitely apply to printers purchased from Currys?I see the …Does this definitely apply to printers purchased from Currys?I see the offer listed on the John Lewis products and HP direct, but not Currys.> was looking at the 6234 specifically. Yes they are a little behind on the update on the site. Re: Model 6234.I just spoke to Curry's and they say it is only 7 months …Re: Model 6234.I just spoke to Curry's and they say it is only 7 months with them, not sure where you got the 15 months perhaps you could please confirm.And can someone please tell me does this mean free ink for 15 months and is there a limit to how much they will give you?Thanks. No it’s definitely 15 months at the moment. They just haven’t got their information updated. Struggling to find much more detail about it on the HP site, but the way …Struggling to find much more detail about it on the HP site, but the way it reads to me is it’s 12 months instead of the free trial included with the printer, not as well as?the cheap currys one is listed with 7 months free to start with, can’t imagine you’d get both the 7 months + the 12 months + the freeink month + the referral month?? 21 months free ink?? Currys PC World have extra months bundled on top as a mention in my original post. If you buy the 7134 you get 32 months because of the £32 gift card in the box if you stick to the 50 page plan after the initial free months are used. If any, what would be the cheapest printer in the list with separate inks? …If any, what would be the cheapest printer in the list with separate inks? Otherwise I would opt for a mono/colour laser one. Which one would anyone recommend if I primarily would like to use it for printing photos from my phone at home? My Envy5030 prints from IOS devices anywhere,you need to check settings? Does any one know if this will work with a MAC with High Sierra OS. Need to get a new printer quickly for kids homework. Does any one know if this will work with a MAC with High Sierra OS. Need …Does any one know if this will work with a MAC with High Sierra OS. Need to get a new printer quickly for kids homework. Yes I use mine on a Mac and have no problems. One question...i have an old hp printer currently on a 1.99 p.month plan for the last 2 years or more...can i cancel this...donate printer to charity shop...and still get 15 months free from this new printer at the same address??? Reserved n collecting tomm!One question...i have an old hp printer …Reserved n collecting tomm!One question...i have an old hp printer currently on a 1.99 p.month plan for the last 2 years or more...can i cancel this...donate printer to charity shop...and still get 15 months free from this new printer at the same address??? I'm in the same situation. I believe the offer is per account and printer. So setting up your new printer in a new instant ink account (use a different email address) should be fine. To be safe I'm putting this in my wife's name, but I don't see how they could lock it to your address. Happy to be corrected of course if anyone knows any different. I'm in the same situation. I believe the offer is per account and …I'm in the same situation. I believe the offer is per account and printer. So setting up your new printer in a new instant ink account (use a different email address) should be fine. To be safe I'm putting this in my wife's name, but I don't see how they could lock it to your address. Happy to be corrected of course if anyone knows any different. Yes I have four instant ink printers on my login for hp and all work fine. Am I being thick but why has this one get an extra 3 months? When the HP website clearly states 12months? Do these HP printers come supplied with ink ? I bought the 6950 in December as it worked out free after cashback, with referrals I have free ink until July. Tempted to get the Envy 4527 from Argos for £35 just for the free ink. Would keep the 6950 on the lowest package. Presumably I couldn't transfer the 12 months to the 6950 so would need to set up a new account? Special offer for Currys/PC World. Yes there are setup cartridges in the box, and enough to print a fair bit off on, and the set of instant ink welcome cartridges arrive within 10 working days once you have setup Instant Ink. Great find.I bought the 6950 in December as it worked out free after …Great find.I bought the 6950 in December as it worked out free after cashback, with referrals I have free ink until July. Tempted to get the Envy 4527 from Argos for £35 just for the free ink. Would keep the 6950 on the lowest package. Presumably I couldn't transfer the 12 months to the 6950 so would need to set up a new account? The 4527 isn't part of this offer, its a old model which the 5020 replaced about a year ago. Yes there are setup cartridges in the box, and enough to print a fair bit …Yes there are setup cartridges in the box, and enough to print a fair bit off on, and the set of instant ink welcome cartridges arrive within 10 working days once you have setup Instant Ink. does it specify model numbers somewhere on the HP website? I can only see that it has to be an envy. Argos website has been updated to now say 12 months trial for the 4527.
does it specify model numbers somewhere on the HP website? I can only see …does it specify model numbers somewhere on the HP website? I can only see that it has to be an envy. Thanks, would always go through a device to preview what Im printing, so not worth the extra for my use, 6234 it is. Ive got a £20 back on a £20 spend on quidco to use, bargain. All the information I have and have been told is that the 4527 isn’t part of the promotion but I am digging. All the information I have and have been told is that the 4527 isn’t part o …All the information I have and have been told is that the 4527 isn’t part of the promotion but I am digging. ok, thanks for looking. I guess if I get a screen grab if I do buy it I should at least be able to get my money back if I don't get 12 months. If you don't think it is included in the offer you might want to edit the heading though as it currently says any envy model any retailer. ok, thanks for looking. I guess if I get a screen grab if I do buy it I …ok, thanks for looking. I guess if I get a screen grab if I do buy it I should at least be able to get my money back if I don't get 12 months. If you don't think it is included in the offer you might want to edit the heading though as it currently says any envy model any retailer. Good call will make adjustments once I confirm either way.